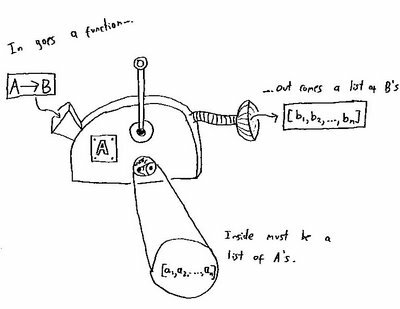 I've decided that the Yoneda lemma is the hardest trivial thing in mathematics, though I find it's made easier if I think about it in terms of reverse engineering machines. So, suppose you have some mysterious machine. You know it's a pure functional Haskell machine (of course) with no funny stuff (no overlapping or incoherent instances or anything like that ). The machine works like this: for some fixed type A, whenever you give it a function of type A -> B it gives you back an object of type B. You can choose B to be whatever type you like, it always works. Is it possible to reproduce the machine exactly after testing it just a finite number of times? Sounds impossible at first, it seems the machine could do just about anything. Think about how this machine could work. You can choose B freely, and whatever B you choose, it needs to come up with an object in B. There is no way to do this uniformly in Haskell without doing funny stuff. (I'm ruling undefined to be funny stuff too.) So how could this machine possibly generate a B? There's only one possible way, it must use the function of type A -> B to generate it. So that's how it works. It has an object a of type A and when you hand it an f it returns f a. You should also be able to convince yourself that there's no way it could vary the a depending on what f you give it. (Try writing a function that does!) Having narrowed the machine's principle down, it's now easy to figure out what a the machine is using. Just hand it id and it'll hand you back a. So in one trial you can deduce exactly what the machine does (at least up to functional equivalence). You're probably wondering why the functions are called these names. See footnote  for that. I'll leave it to you to prove that check1 and uncheck1 are inverses to each other. You should be able to prove that check2 and uncheck2 are mutual inverses. which looks just like our machine2. So however we munge up our list to make our machine unlike machine2 we can always 'commute' the munging to the right so it acts on the internal list of A's, converting into a machine like machine2. This time we hand our machine a A -> B and it gives us back another function, but this one is of the type C -> B, for some fixed C. It modifies the 'front end' of the input function so it can take a different argument. How could that possibly work? There's one obvious way: internally the machine is storing a function C -> A and when you hand it your function it returns the composition with the function it's storing. Maybe you think there's another type of machine that converts A -> B's to C -> B's. If you do, try writing it. But I think there isn't. uncheck3 pulls extracts the internally represented c -> a and check3 makes a functionally equivalent machine out of one. The above examples follow when we consider the functors I,  and ((->) c) (for various values of c) respectively. Yoneda's lemma is essentially the statement that check and uncheck are mutual inverses. So if you understand my examples, then you're most of the way towards grokking the lemma. I'll confirm that check f is natural, ie. that (check f) . (fmap g) = (fmap g) . (check f), although, as I mentioned above, this is automatically true for polymorphic functions without funny stuff. So that's it, Yoneda's lemma. It's trivial because the isomorphism is implemented by functions whose implementations are a couple of characters long. But it's hard because it took me ages to figure out what it was even about. I actually started with examples outside of Haskell. But Haskell has this weird property that polymorphic functions, with minor restrictions, are natural transformations. (I think this is the deepest mathematical fact about Haskell I've come across.) And as a result, Hask is an excellent category in which to learn about Yoneda's lemma. I also recommend What's the Yoneda Lemma all about? by Tom Leinster. His presheaf example is the one at which these ideas started making sense to me - but that's because I've spent a lot of time playing with Čech cohomology on Riemann surfaces, so it might not work for everyone. This comment is also worth some thought. In fact, is the Yoneda lemma itself a Theorem for Free? And if you're still confused, let me quote the ubiquitous John Baez: "It took me ages to get the hang of the Yoneda lemm[a]". And nowadays he's one of the proprietors of the n-Category Café! f is the identity for everything except for objects of type Int. This is an example of what I call "funny stuff". Feynman defined a trivial theorem as one that had been proved. Thanks for making the Yoneda lemma start to make sense to me. It seems that :check3 a f" should be "f . a" instead, no? You're right. Maybe you can see the cause of my error. I originally wrote the code using fmap to effect the composition as defined later. Thanks a lot, this is very cool. I am just now reading about the YL in 'Category theory for computing science' and I felt a strong desire to find an explanation in haskell. Would be cool if someone wrote a book on CT with explanations in Haskell, it seems to be often a lot more clear and understandable than standard mathematical notation.